To be honest, I think I read the synopsis of These Broken Stars (first book in the Starbound Trilogy) right around the time there was a huge buzz being generated about the movie Passengers (which was okay, not great, but as much as I love Jennifer Lawrence, I could’ve done without her… because I felt like Chris Pratt practically carried the movie). After watching the movie, I wasn’t as hyped about starting the Starbound Trilogy but eventually I did begin reading it and it was surprised to find that it had absolutely nothing in common with the movie Passengers, so I’m not quite sure how or even why, I’d linked the two. In any case, the first book was okay. The story was quite cliche; boy with humble beginnings, falls in love with rich girl. However, there were a few sci-fi elements tossed in for good measure, including the mode of transport (hyperspace travel), time period (far into the future), and setting (planets other than Earth… due to the aforementioned hyperspace travel). One half of the love duo is Lilac LaRoux sole heir to LaRoux Industries Empire and daughter to the richest and most powerful man in the galaxy Roderick LaRoux. The other main character is war hero Tarver Merendsen. Both teenagers happen to be aboard the massive, luxury spaceliner Icarus, when the Icarus gets yanked out of hyperspace and plummets down to some random planet. Lilac and Tarver managed to survive in an escape pod and get to know each other on the primitive planet while they wait to be rescued. They go through stuff and end up falling in love. The end. 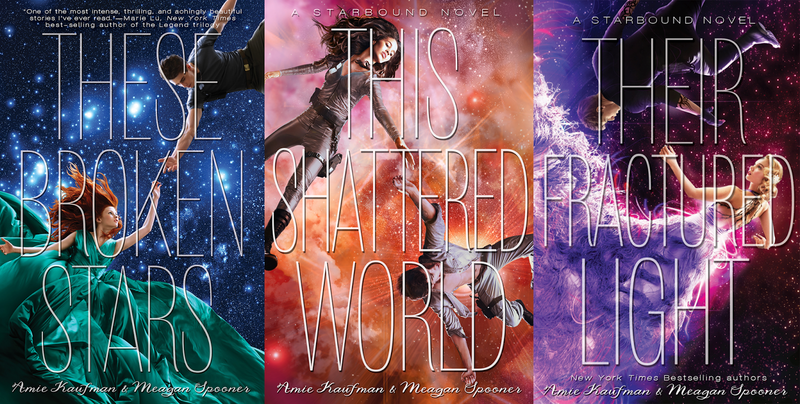 So yeah, pretty much a love story set in space. Boring! I thought the second book would pick up where the first book left off but it didn’t, which is why I moved on to other books before coming back to this one, many months later. I was pretty annoyed when I realized that the second book was going to be focusing more on a new pair of star-crossed lovers. This time it was rebel leader Flynn Cormac on an underdeveloped planet (in the process of being terraformed) and Jubilee Chase who was Captain of the armed forces sent to crush the rebellion. Again, they fall in love. Together they uncover a conspiracy. Jubilee trusts Tarver because they served in the military together at one point (off-planet) so she trusts him enough to share what she and Flynn have uncovered. Yadda, yadda, yadda. The second book ends with a broadcast of Flynn and Jubilee calling on the galaxy to witness LaRoux Industries‘ corruption. New book. New couple. Sofia Quinn is a con artist and Flynn‘s childhood friend. She managed to escape the planet during the chaos that ensued and carved out a pretty nice life for herself, except she’s hellbent on revenge for the mysterious death of her father (back on the planet where she and Flynn grew up). She blames LaRoux Industries and she’s doing everything she can to make them pay. Gideon Marchant is an urban warrior (read: hacker) whose older brother used to date Lilac LaRoux, so all threeo of them used to hang out together, when they were all much younger, except Gideon‘s older brother died in the war. Sofia and Gideon meet when a security breach interrupts their separate attempts at infiltrating LaRoux Industries Headquarters. Shortly after, they’re in love (so convenient)! All the couples meet up but nobody trust anybody due to their past history with each other. They hatch a plan. Plan goes sideways. Yadda yadda yadda. I don’t even understand what happened… but I seriously struggled to finish reading the last few chapters in the third book. In fact, I only finished it a day before this past New Year’s (I was sleeping over at my cousin’s and as I’ve mentioned before… I don’t sleep) so it was around 3:00am when I pulled out my Kindle and forged ahead with this mind-numbingly boring story. I wanted to finish it as a matter of principle, might as well see it through since I’ve come this far, y’know? So apparently Roderick LaRoux trapped these alien life forms (Energy Beings) and with the help of the many, many, many staff members at his disposal such as scientists, researchers, etc… (again, richest and most powerful man in the galaxy) studied these Energy Beings, tortured them, and harnessed their power for his own use (for example, hyperspace travel, which wasn’t a thing pre-Energy Beings) up until the Energy Beings got fed up and started lashing out. The story concludes with the Energy Beings offering humans (or rather the group) a choice, which kinda’ reminded me of another book called And All The Stars (reviewed here). I wonder if all these authors are reading each other’s novels and “borrowing” ideas from each other or maybe extra-terrestrials in the form of Energy Beings is a logical assumption that every author reaches, eventually. In any case, I give this trilogy two thumbs down (that’s how you know it’s serious lawl). Actually, if you enjoy romance novels, then this is definitely for you. If you prefer something heartier, I’d say skip the Starbound Trilogy. Okay first of all, the ‘poems’ between the chapters in ‘These Broken Stars’, weren’t even poems. They were snipped of Tarver being interrogated. Secondly, there are loads of stories that do the pov switch between each chapter. And there are also loads of books that have a different couple for each book. Personally, I really loved the story. It was new and interesting. Of course any story that has teenage romance is going to be a little cliche but they put an interesting spin on this thing! I have yet to read the second and third book, but I’m sure I’ll love them just as much. The only thing I dislike about the book is the fact that it’s written in first point of view. Glad you loved “These Broken Stars”! I sincerely hope that you’ll love the other two. Unfortunately, I didn’t, but that’s okay. We’re all entitled to our own opinion, right? Personally, I could’ve done without those snippets of Tarver being interrogated. It would’ve been fine if this was a tv show or a movie, but as a book, I found that distracting. As was all the switching back and forth between characters. I understand that a lot of stories actually do that. I’ve actually read “A Song of Fire and Ice” which has a lot of that going on. However, doing something and doing something masterfully, are completely different things (at least to me). In the “Starbound Trilogy” I don’t believe it was implemented correctly. Once again, I found it distracting and it made the overall flow of the story choppy and distorted (for me). Lastly, I do agree that they put an interesting spin on this thing, but I feel that plot had potential (so much potential) to be… more but the author never really took it there. The story just never took off for me. I was waiting for something that never happened. Glad you liked it though and as I said, I really hope you enjoy the other two whenever you do get around to reading them! I suggest that whenever you get the chance to, give the Red Rising Trilogy a read. I’m even going to go as far as to guarantee that You. Will. Love. It.